OPAL – Today I pulled the card for the angel Opal. 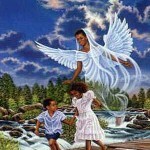 She brings the message that your children on earth and in heaven are well cared for by God and the angels. She also reminds us that we are all God’s children. I also pulled the healing card of Harmony. I will strive to live in harmony with nature and others. When I think of the word harmony in music, it is to be in accord with, or to accompany others. Harmony in music creates a pleasing sound . When I live in harmony with the world and my surroundings, the result is a pleasing and beautiful world.